After a heated poll, we ended up going with a hybrid of Elise Yellow and Elise Posh Picnic. Her favorite colors are yellow and red so we went with black, white, grey, yellow and red and it really worked with everything. 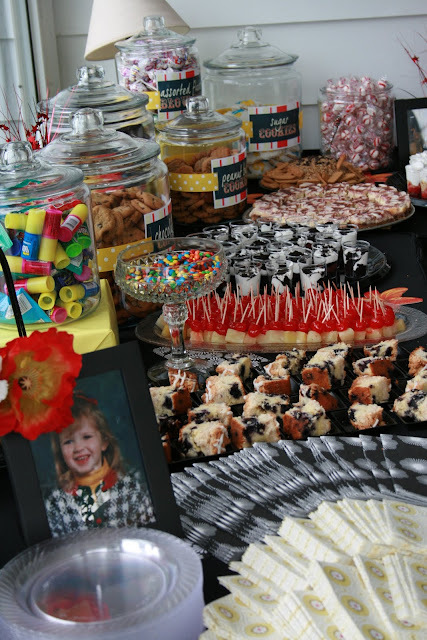 Elise specified that she didn't care about anything except the desserts so that left us with free reign over most everything. She piped in opinions here and there but mostly left the concepts up to me. She is also all about anything retro so we went with a slightly retro feel while still keeping it young. 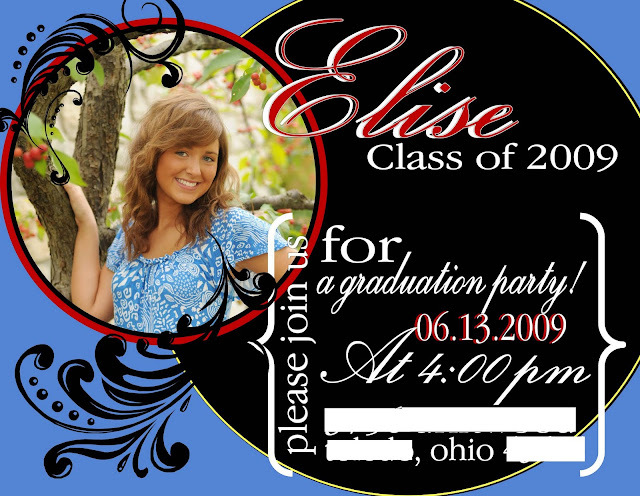 The invites! 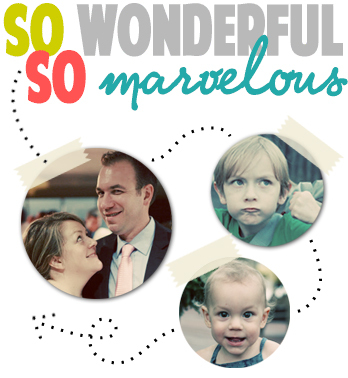 I dreamt these up and had them printed to postcards that we slipped into her graduation announcements for the adults and she was able to hand out the cards to her friends as well. 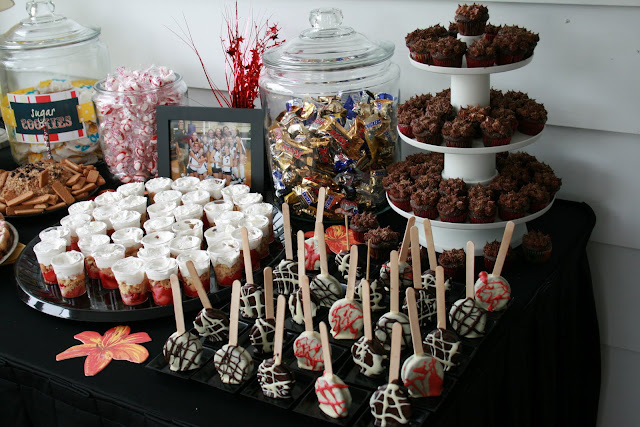 Since she only mentioned desserts when we were brainstorming food ideas, we went with an INSANE dessert buffet. It, by far, topped anything I've ever done in scale and variety. 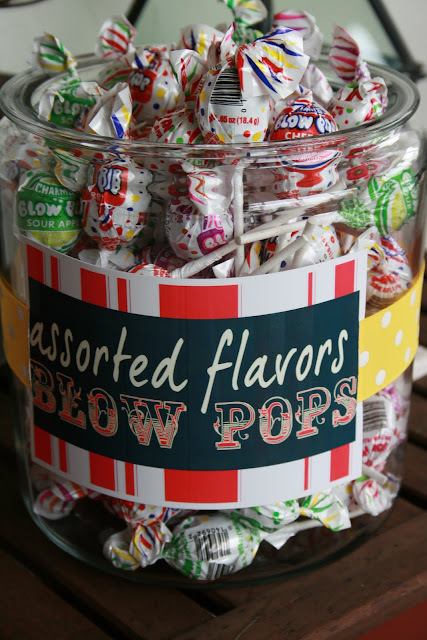 We used old fashioned 1 & 2 gallon jars to fill with candies and cookies, each with a custom tag in the party colors. Try as I may, there wasn't a good angle to get the whole thing in at once! We set it up in an L shape in the corner of the screened in porch. 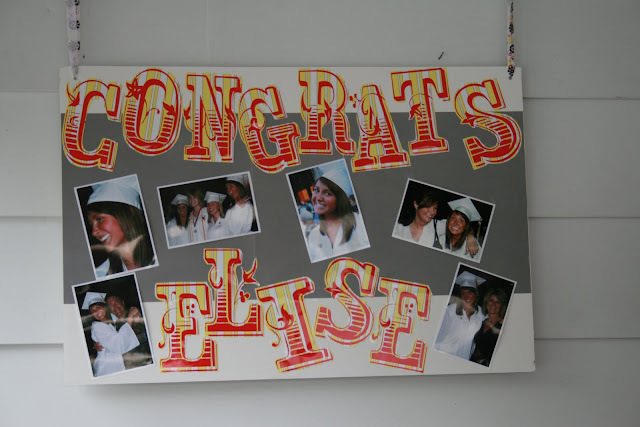 Elise's mom made this collage and we also framed lots of pictures of her throughout her school years to add to the food tables, the dessert tables, and the gift tables. 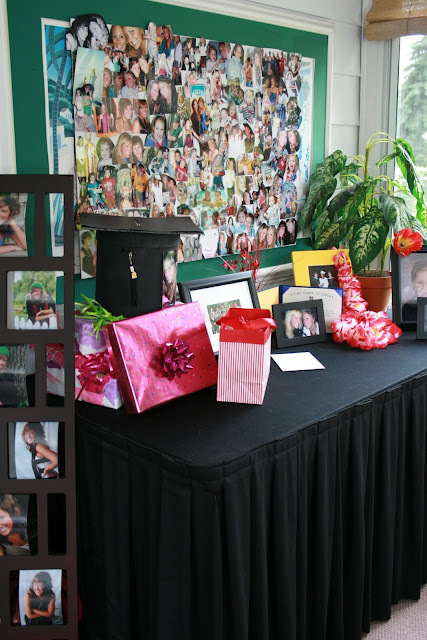 We also had all of her senior pics in a stand up frame for people to look at. 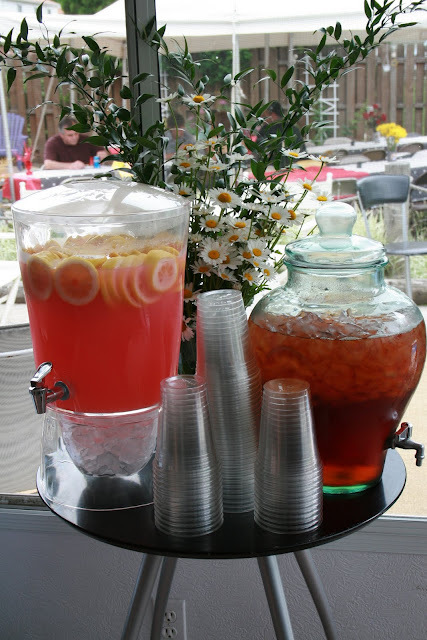 One of the drink stations! This one had pink lemonade and iced tea. We also had soda & bottled water for the kids and beer for the adults in a commercial cooler outside. Both drink dispensers were picked up at Costco and have been used a TON all summer! Each of the tables had a centerpiece of different flowers in reds and yellows. 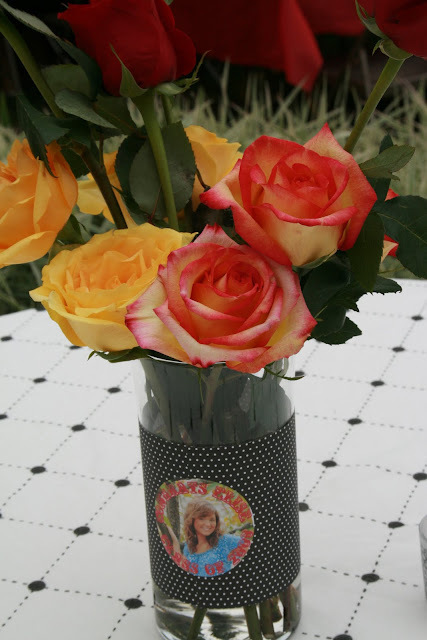 I made a super EASY cuff to go around basic vases out of scrap paper and stickers that I printed with Elise's picture on them. The best idea we had was to have a tent put up. 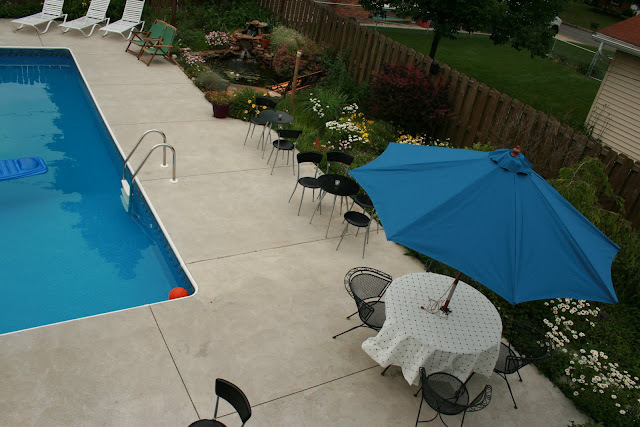 It kept people outside and enjoying the pool and the backyard rather than inside the house. 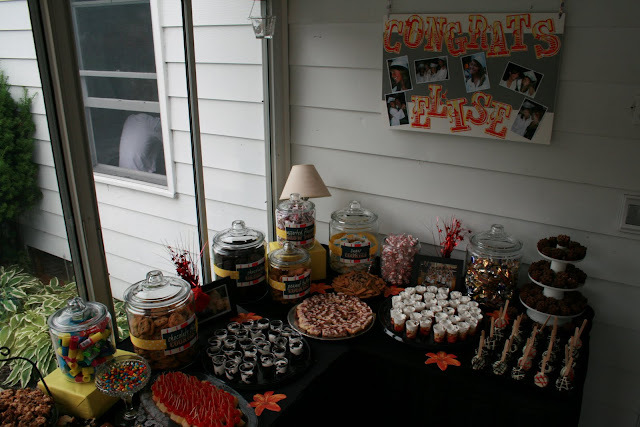 We used the inside to set up the food, appetizers in the kitchen and the dining room held the two buffets, half Mexican food and the other half picnic foods. There was so much food I can't even list it all! 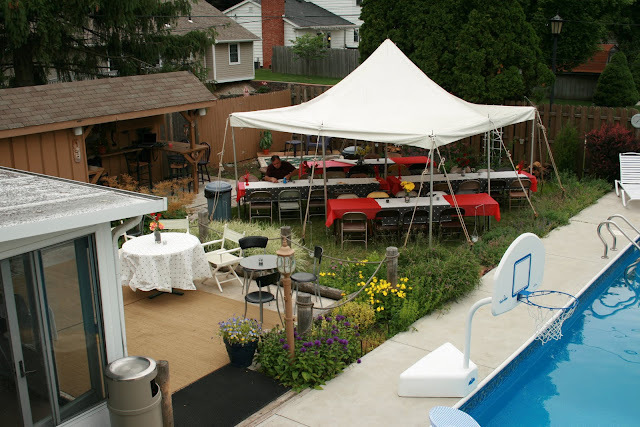 We set up black bistro tables along the pool and long banquet tables under the tent. There was also seating on the deck and in the tiki bar. We also had the dj set up under the tiki bar. 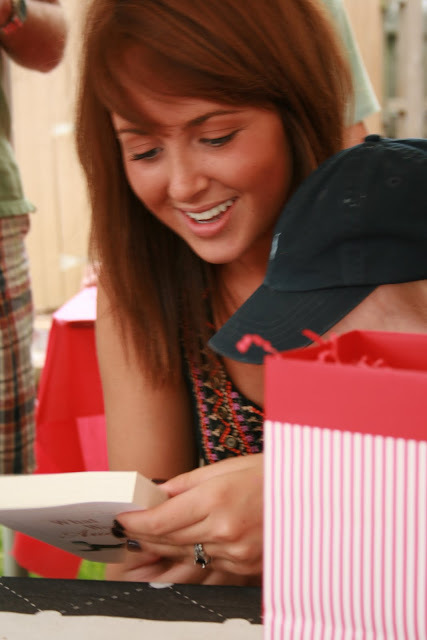 Finnegan bought Elise the book, "What Would Audrey Do?" for her graduation gift. She's a big Audrey Hepburn fan so I thought she'd get a kick out of it.